Where: Talen Energy Stadium, Chester, Pa. When: Saturday, April 28 at 3:30 p.m.
Another year, another scrappy D.C. United team led by manager Ben Olsen coming to Chester. Despite a somewhat respectable offseason haul of new players, D.C. continues to play very much like a traditional opportunist and physical Olsen squad. 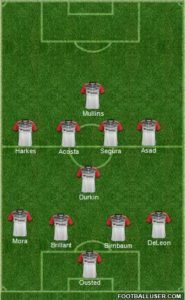 Jim Curtin has been remarkably successful versus D.C. United, owning a strong 4-1-1 record against the I-95 rival. 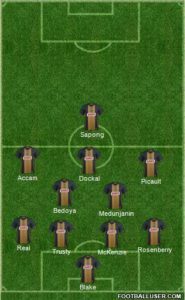 With the Union’s offensive woes well documented, though, can Curtin hit the right formula to finally kick-start the attack? United had last weekend off following a 1-0 victory over Columbus Crew at one of D.C.’s many temporary homes until Audi Field is finished later this year. A (very) early goal in the first minute of the game was enough for D.C. to bunker, earn their requisite red card, and hold off Columbus’ attack with ten men. Say what you will about Jim Curtin’s coaching ability, but at least Union fans don’t have to sit through Benny Ball 34 times a year. On offense, Luciano Acosta remains a true gnat, tricky and creative on the ball, and D.C.’s greatest threat to exploit defensive lapses. Yamil Asad has had moments where he looked like the game-changer he was in Atlanta last year, and striker Patrick Mullins has just one shot on goal all season (!). Granted, he scored it, but that’s never a good sign for a forward. U.S. international Paul Arriola is suspended from the match for an ugly challenge against Columbus. Yet, D.C. are even with Philadelphia on points and ahead in goal differential. Olsen’s tactics remain stout with the sole goal of making it difficult for opponents to implement their game plan. 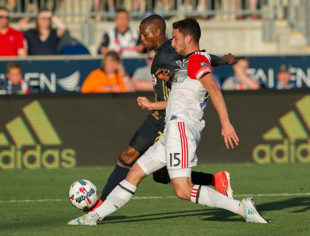 Their affairs have mostly been low-scoring, brutal matches and there’s little reason to think Saturday’s matchup at Talen Energy Stadium will be any different. Yeah, so the Union need to score, huh? Their latent offense is going to have to exercise some major patience – and some creativity, finally – if they want to break down D.C.’s annoying tactics. Benny Ball is all about clogging up the middle of the field, forcing the opponents to possess the ball wide, and send in aimless crosses, which D.C. can quickly clear and recover to set up Yamil Asad and Luciano Acosta charging down the field. The Union have been abundantly cross-happy this season so they’re in trouble if that doesn’t change on Saturday. For Philadelphia, it’s going to be all about patience and, as Dan Walsh sagaciously pontificated this week, movement. The Union’s front three are scarily sedentary when the team are on the ball. To break down a stodgy defense like D.C.’s, they’re going to have to be extremely active to pull defenders out of position if they ever want to score a goal (ever) again. D.C. academy product Durkin will likely be starting at the No. 6 on Saturday with Junior Moreno injured. The 18-year-old midfielder/defender is a talented Jack Elliot-esque passer that can hit line-breaking passes perfect for United’s counter attack. But he’s 18 and has thus far only played spot time in his rookie season. If Dockal can’t find space against Durkin in his first-ever MLS start, don’t count on it against any of the better players in MLS. Yamil Asad. He’s been on-and-off so far in his time with D.C., but Asad is good for an incredible play every game or two that can completely upend a match. The Union finally have to score, right? And D.C. United are not a good team. If the Union finally catch up with their xG, exploit some very winnable matchups all over the field, and exert some patient build-up. they should easily win this game. Prediction: 0-0. Union have 15 shots but none on goal. “should” is the key word there! Hidden Figures ……. on a side note…. as much as i did not care for Albergs attitude he did score 7 goals in 700 minutes of play. This was one of the best rates of scoring in the league. Ernie did not bring any bench player of his caliber to the 2018 roster. I also hate to say it but Fhabinos absence on the left bringing the ball up from the back and creating chances has also hurt scoring. Finally although Pontius had an off year he played with grit and won the ball back set up the pass for the assist and his second effort sometimes resulted in the union getting the direct kick that Harris put in or a corner that the Union scored from. just sayin part of the missing hidden figures….. Very small error in the first line of this article – you have DC listed as ranked 1st in the East, not 9th. Otherwise, yeah, I agree completely with Andy Muenz. 0-0, Union make lots of low-probability or off-target shots. Another minor error – this game is not airing on PHL 17 according to any listings I can find, including on the Union’s web site. Looks like some Univision Deportes for me. Or — wait — maybe Twitter?!?!? since i’ve ruled out attending, they really don’t want me to watch this one. fine. i’ll catch the 44 comments on the match report article. 1-0 Union, DC never attack’s here. Um………channel 17? Channel 17? No match is on…….wtf?